My big sister is engaged! She got engaged this past Thursday night, and we are all super excited for her. 🙂 There’s an engagement party next Sunday, so I plan to spend the week making all kinds of fancy treats for it. As you can imagine, my blogging time will be very limited, so my friend Rachel Sicherman agreed to step in and write an awesome post for you guys to enjoy while I am knee deep in Royal Icing and Buttercream Frosting. Rachel is not only the savviest shopper I have ever met (and she writes excellent shopping tips for the ordinary folks among us on her blog) but she is also the only person I know other than myself who finds things like candy thermometers, macro lenses and grammar interesting…all in the same sentence! I’m jealous of her forays into the world of candy making, and must try this soon myself! The best in the nation, first rate. But your low-sugar diet can wait. He then listed the ingredients and instructions for a recipe that’s been in his family for generations. Since I don’t use all his ingredients, I’ve changed the recipe a bit and found the resulting chocolatiness so supreme that I spent from 12 to 4am making them for my Mishloach Manos (Purim Basket) this year! And as Miriam can surely attest, they taste fabulous. Line an 8″ x 8″ baking dish with silver foil without leaving any space between the foil and pan. I prefer a glass dish, but metal is fine too. Heavily grease the foil with the extra butter. Don’t be stingy with the butter because otherwise you’ll pay for it later, and besides, you’ll save yourself, what, like 6 calories? Pour all the remaining ingredients, except for the vanilla extract, into a heavy pot that can hold around 4 quarts. Turn the flame on to medium-high, or a bit higher if necessary. Bring the mixture to a boil. Once you start noticing the first bubbles, clip a candy thermometer to the side of the pot. This is extremely important because there is no way to guess the temperature, which needs to be exact when it comes to candy-making. Stir the chocolate every so often. You’ll notice the chocolate changing consistencies several times, and this is normal. The mixture must reach firm ball stage, or 246-247 degrees. It’s hard to tell the exact degree if you’re using a glass thermometer, but it’s better to err on the lower side. That’s why it’s a good idea to use a digital one, or to draw a line on the glass thermometer with a permanent marker before you stick it into the pot. Once the mixture reaches firm ball stage, shut the flame. Quickly add the vanilla extract and stir (you should hear a popping noise). Immediately pour the mixture into the greased pan. Let it cool for about an hour, or refrigerate it until it stiffens a bit. Once cooled, remove the caramel from the foil and place it on a large sheet of parchment paper. If you didn’t grease the foil well enough, you’ll now pay the price so don’t say you weren’t warned! Using a long, sharp knife that has been buttered, cut the chocolate into small pieces (about 1/2″ ‒ 3/4″­ squares) and wrap each piece in waxed paper (see instructions for folding below). 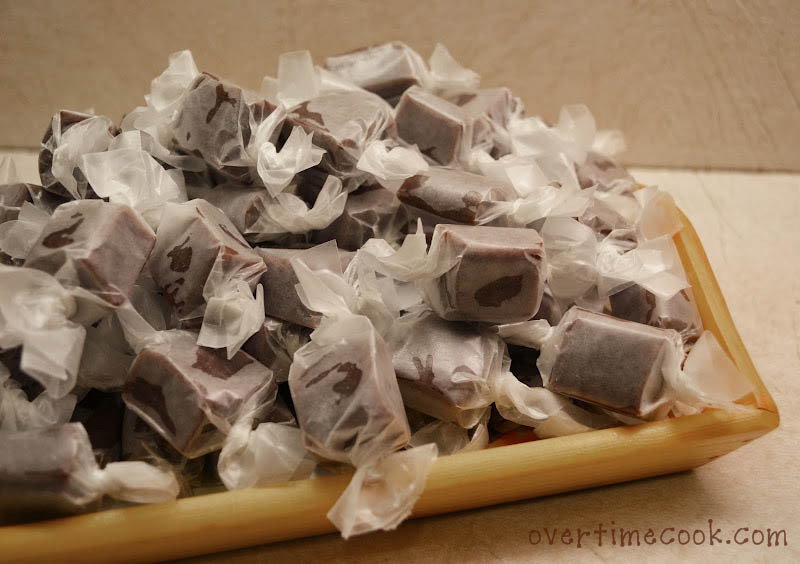 This recipe yields about 70 caramels, and each needs to be wrapped individually to prevent sticking to each other, and for elegance, of course. Since cutting could take a few minutes, I like to pre-cut my waxed paper while the caramel is cooking. Cut the waxed paper into 3-3.5″ squares. Here’s how to wrap them: Place a caramel onto the center of the paper. Fold 1/4″ of the top edge down towards you and press firmly to make a pleat. Bring the bottom edge up towards the caramel and proceed to roll it up, ending with the pleat on top. Slowly twist the edges to close like a candy wrapper. If you go too fast, the paper will tear. Don’t bother about the oil because it’ll become absorbed. Congrats to your sister 🙂 Those look really delicious, very impressive. I love the wrapping, so thanks for the detailed explanation – I’m never good at delicate things like that with my big man hands. OMG! Ruchiccio- I am ultra impressed. My only regret is not getting to eat any. Can I place an order for next time? You should go into the candy making business. I would never even attempt to try them. Congrats to your sister! And these guys look killer! I accidentally made caramels the other day and now I’m obsessed. I’ll have to try this recipe next.